Welcome by, friends! 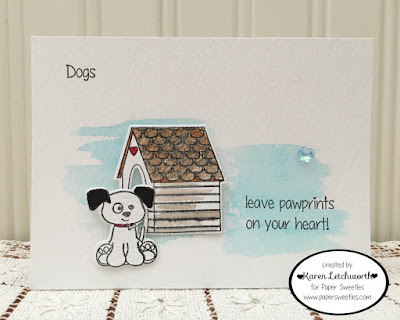 Today is New Release Day at Paper Sweeties, and that means YOU can now purchase the ADORABLE new Sweeties Pets Sweet Cuts that coordinate with the Sweeties Pets Stamp Set. This sweet pet-lovers set is filled with the cutest images and sentiments to help you create something "PAWS"itively adorable. I used watercolor card stock to stamp and cut the dog and his dog house. And just look at that sweet sentiment......dogs really do leave their paw prints on your heart. The images in this set are so cute that they really don't "need" a whole lot of coloring. That's another great thing about all of Paper Sweeties stamps....they look fabulous on their own, when stamped on patterned papers, or when colored. They're so sweet either way. I used watercolor paper so that the little bit of color I did add looks so much fun. The dog house almost looks "dirty" like the puppy rolled around in it. SO cute! Here's the list of all my talented teammates at Paper Sweeties who have prepared something sweet to inspire you today. And we'll all be back again tomorrow with even more fabulous inspiration. Paper Sweeties wants to be your go-to shop for stamps, inks, sweet cuts, seam binding and so much more. We're here to help and to inspire. Thanks for stopping by!